Read the italicized passages of Scripture in Chapter 2. In verse 15, Jesus says, “Repent and believe the good news!” What does it mean to repent? What does the term “gospel” mean? Timothy Keller writes, “The essence of other religions is advice; Christianity is essentially news” (p. 15). What is the significance for us of that distinction? What is the good news of the kingdom of God (pp. 16-17)? 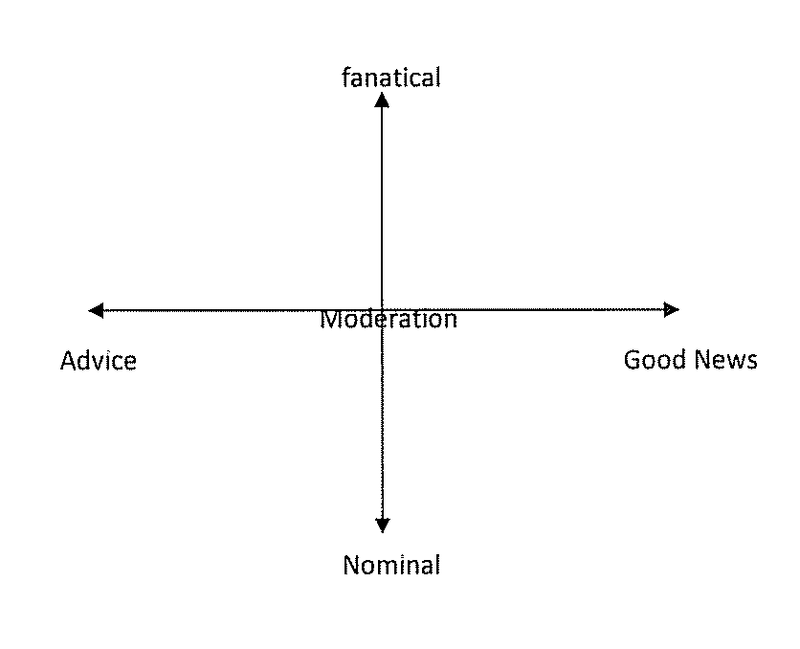 In the diagram below, the horizontal axis refers to how people understand Christianity, as advice or good news. The vertical axis refers to the fervency with which one believes. What is the difference between being in the top left corner of the top left quadrant and being in the top right corner of the top right quadrant? In the diagram above, where does Jesus call his followers to be? Where does the world want us to be on the vertical axis? How was Jesus’ authority different from that of other teachers? Describe what effect Jesus’ authority had on his listeners. Timothy Keller writes, “The path Jesus takes you on may look like it’s taking you to one dead end after another. Nevertheless, the thread does not work in reverse. If you just obey Jesus and follow it forward, it will do its work” (p. 24). Can you think of a time in your own life when you experienced this? In closing, read the last paragraph of the chapter (pp. 24-25).